demographics. Apparently there was a big spurt in gun ownership in the generation born between 1920 and 1960, and then the spurt went away. Cohorts born in later years all own guns at substantially lower levels. It’s hard to square this up with gun sales because (a) nobody seems to reliably track overall gun sales, and (b) the vast majority of new gun sales are made to a smallish number of big customers, such as police forces and militaries. Still, unit gun sales seem to have gone up pretty explosively between 2005-10, doubling from around 5 million per year to 10 million per year. FBI background checks, a proxy for gun sales to individuals, have gone up too. So I’m not sure what’s going on. Gun sales to individuals seem like they’ve increased a fair amount over the past decade, but the number of households reporting gun ownership has decreased a bit. 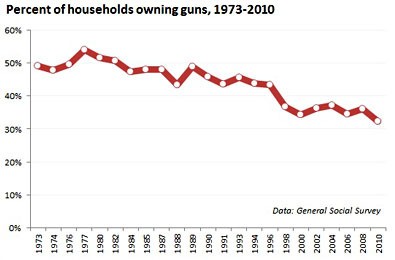 Does this mean that fewer households own guns, but the ones that do own guns have more and more of them? More data please!